What is the UK National Lottery Jackpot for 2015-07-01? | £4 Million | It is a Rollover! What is the Euro Millions Lottery Jackpot for 2015-06-30? | £25 Million | It is a Rollover! What is the UK National Lottery Jackpot for 2015-06-27? | £5 Million | It is a Rollover! When Tyrone Curry became a millionaire on the state lottery five years ago, the school janitor well and truly cleaned up. 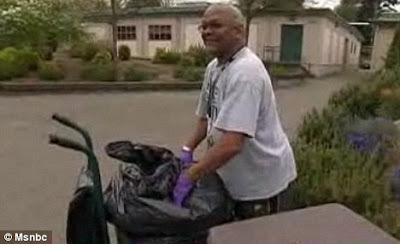 But rather than pack in his job sweeping floors and clearing out trash at Evergreen High School in Washington State , the grandfather went straight back to work. 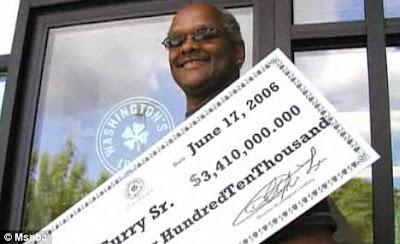 In a remarkable tale of humility despite a sudden surge wealth, Mr Curry has spoken about the quiet life he lives with his family in a small home in Seattle, spending his money on amenities for the school he serves rather than on himself. 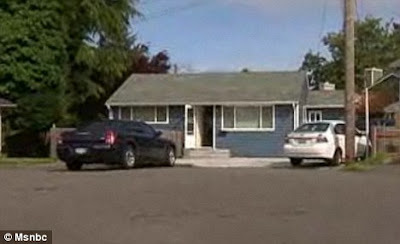 He decided he would stay living in his small home at the end of a cul-de-sac in Seattle - where he still lives five years later with his wife, his mother-in-law, two step-sons a sister-in-law and his two-year-old grandson. 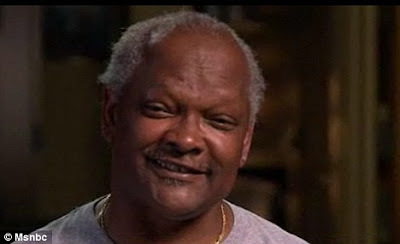 'I’m just Joe Citizen,' Mr Curry told MSNBC. 'My mum was the mother of the neighborhood. All the kids came to our house, so that’s why my home is open, too. Mr and Mrs Curry were facing bankruptcy when they bought the lottery ticket. They spent little of the winnings on themselves - just enough to pay off their debts, put up a fence and a new heat pump at home and to pay for a new driveway on which to park the car he still drives to work five years later. They also bought a time-share on an apartment in Las Vegas, which they rarely use. 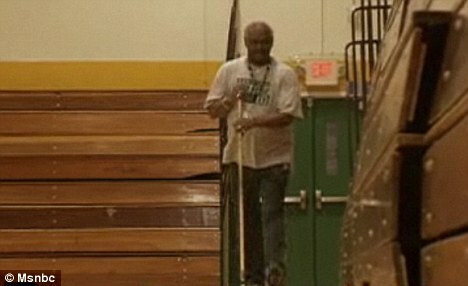 Colleagues assumed the Vietnam War veteran would quit his humble job as a janitor, but he shocked them by staying on to keep sweeping the school floors. Describing why he still wakes at 4am to head to work when he could be spending his money on luxuries, Mr Curry said: 'You need to be doing stuff: That’s my philosophy. The largest chunk of the winnings which he has spent has gone on amenities at the school. Mr Curry, who also coaches the track team at Evergreen, has laid out $40,000 to build a new track for the students and plans to spend more on new tennis courts. He has also paid the college fees for his track team captain, DeVante Botello, whose father left and mother recently passed away. 'He taught me perseverance,' Botello told MSNBC. 'How to hold on and deal with the cards you're dealt. Perhaps most surprisingly of all, Mr Curry continues to buy lottery tickets every week. 'I'm not done,' he explained. What is the Powerball Lottery Jackpot for 2015-06-24? | $80 Million | It is a Rollover! The jackpot for Powerball Lottery has rolled over and you can now play for a massive: $80 Million! What is the Euro Millions Lottery Jackpot for 2015-06-23? | £25 Million | It is a Rollover! The jackpot for UK National Lottery has been won, the next jackpot is: £13 Million! The jackpot for UK National Lottery has been won, the next jackpot is: £10 Million! The jackpot for Euro Millions Lottery has been won, the next jackpot is: £130 Million! What is the UK National Lottery Jackpot for 2015-06-13? | £7 Million | It is a Rollover! The jackpot for Euro Millions Lottery has been won, the next jackpot is: £110 Million!